CLC is a Community Learning Center that provides students in grades K5-8th with academic and technology enrichment, tutoring and homework help. It also offers various personal development programs such as art, recreation, and sports. Registration is required and space is limited. Enrichment activities in Mathematics are designed to complement the Everyday Math and Connected Math curriculums of the regular school day. In particular, using technology or manipulatives students practice mathematical games and routines to improve fact fluency and problem-solving skills. 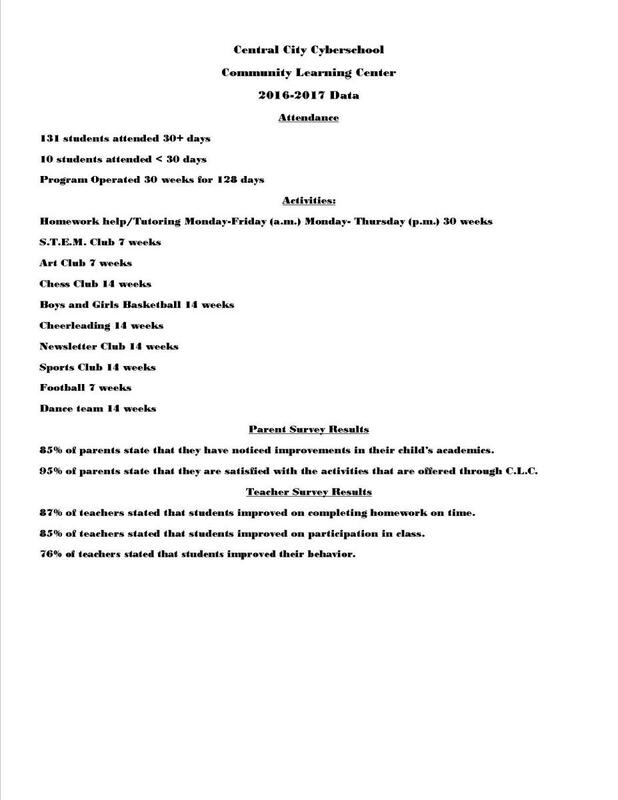 Enrichment activities in Reading provide instructional support that parallels the OCR (Open Court Reading) daily lessons to improve reading comprehension and fluency. For example, using Raz-Kids.com, students use technology and multimedia resources to listen to modeled practice, to read with vocabulary and pronunciation support, to record their reading, to check comprehension with quizzes, and to build word knowledge and solve word puzzles. 90% of the CLC staff (29 of the 32) are the staff of the day school. Therefore, they are well versed in the core curriculum content and instructional strategies, providing effective tutoring and homework support, as well as supplemental instruction and enrichment that complement the core of the school day. CLC is funded by the National School Lunch Program. CLC students receive a free after-school snack daily. The YMCA provides space for sports and recreational activities, at no charge, enriching students’ social and physical, as well as leadership development. The YMCA is physically attached to the Cyberschool, so children move safely, indoors for recreation activities.